Imagine a bleak dystopian future where crime is rampant and multiple citizens are being held as hostages by dangerous people. JYDGE, recently launched on Steam and now available via the Switch eShop, explores this exact scenario. When all goes to hell in the cyberpunk city of Edenbyrg, the local police department launches the JYDGE initiative to sweep the streets clear of crime. 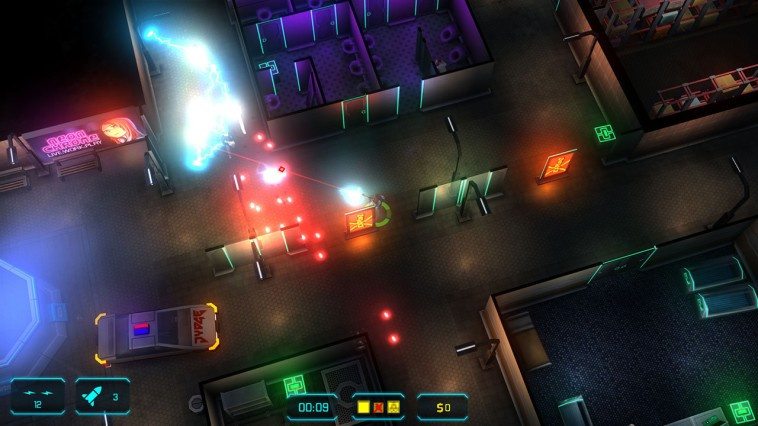 While the concept has clearly been inspired by Judge Dredd, the publisher and developer 10tons has clarified that its new title is both a prequel and spin-off to Neon Chrome. For anyone who didn’t enjoy the rogue-like elements of this recent eShop release, JYDGE is a top-down shooter that is intended to be a more streamlined, simplified and fun experience – comparable to the likes of Hotline Miami and even Mr. Shifty. The procedurally generated levels as seen in Neon Chrome have been replaced with preset levels and the difficulty is now far less punishing. Taking control of the JYDGE, you jump right into the action as a law enforcer. Each level follows a similar pattern – eliminate all enemies in sight, neutralise a key target, save the hostages and then get out. 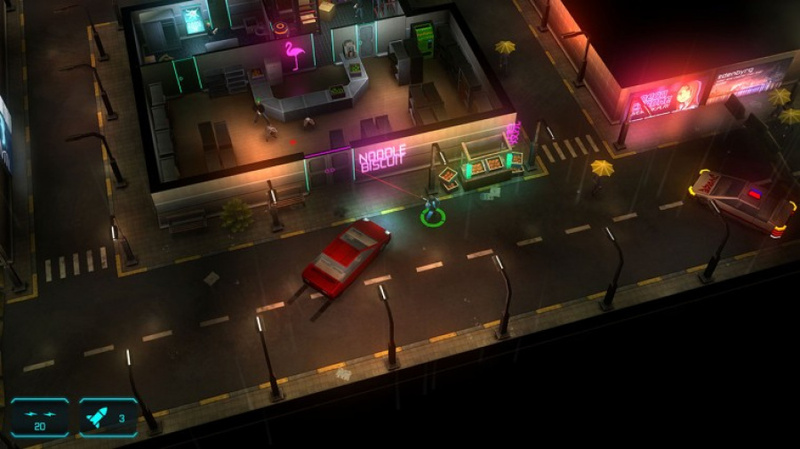 As JYDGE borrows art assets from Neon Chrome, the level presentation is strikingly familiar with bright colours highlighting doorways, signage, collectables and other points of interest. Disappointingly, the futuristic theme still feels just as uninspired. While a bit more colour has been added to levels with the odd patch of greenery from time to time, the design of each stage still lacks variety in terms of layout. For the most part you’ll be breaching buildings that are made up of lobbies, boardrooms and bathrooms. You might find yourself in the occasional bar fight, but you’ll still be awkwardly navigating tight corridors and walking down dead ends into janitor cupboards. According to 10tons, enemy bullets have been slowed to make fire fights more manageable. Sadly though, the shootouts in JYDGE just do not compete with more prominent top-down shooters. Even the generic but upbeat soundtrack promoting law and order doesn’t solve the case. Despite the slower pacing of gun fights, it still struggles when it comes to precision shot making – which severely detracts from the addictive nature and general satisfaction of this genre. The AI of the punk-like enemies in JYDGE don’t help the situation. 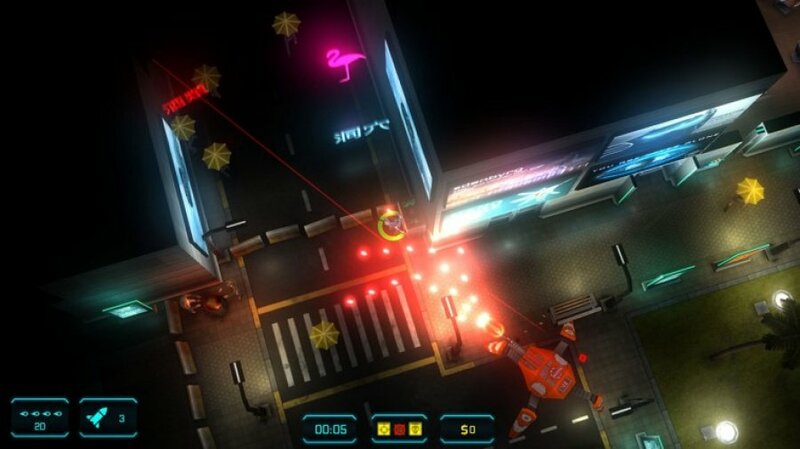 While the JYDGE can take a stealthier approach to each level, if detected enemies will immediately shoot to kill and lack any further strategy against you. Bosses and special enemies like robots are much the same. 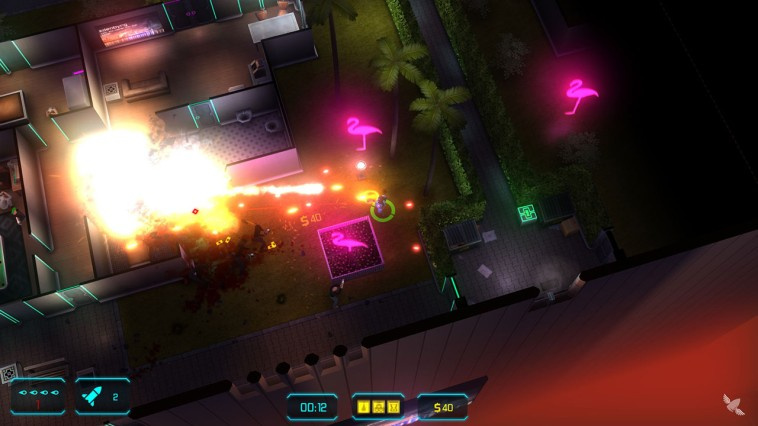 As soon as the JYDGE is spotted, enemies will follow you around an entire level until the fight draws to a conclusion. The most strategy required is dancing about during fire fights or hiding behind walls until the enemy eventually blasts down your cover. Seek & destroy A.I. in this type of game is normally less of a concern, but in JYDGE it becomes a problem when the controls are often imprecise and sluggish – especially when many levels demand twitch reflexes. Fortunately, the environmental destruction offers a brash way to breach rooms within a building. Explosive barrels are also littered around levels allowing players to destroy large chunks of the environment. As minor as it may be, it’s handy to be able to shoot through a wall if your original tactics fail. The “Department of Jystice” is where you go in between levels to upgrade and customise JYDGE - along with the weaponised gavel - using the “confiscated” credits obtained during missions. In the cybernetics lab the “cyberware augmentation module” enables this customisation; with a total of four slots you can boost the JYDGE with extra health, boost citizens’ health, gain additional body armour and even provide the hero of justice with an assist drone. Additional tools such as hacking upgrades can also be unlocked to provide minor advantages in certain levels. The gavel can be upgraded as well, with changes to the type of ammo it shoots and the ferocity of the bullet storm it is capable of unleashing. Unlocking new upgrades all depends on the amount of medals you earn in a level, which are objective-based. These objectives vary, with standard tasks including completing a level within a certain time frame, rescuing all the hostages to looting every container. If you shoot a hostage, or one gets caught in the middle of a fire fight, the outcome is a “mistrial” – essentially game over – and you’ll have to retry. Luckily some enemies won’t always be present on the second go if you’ve defeated them the first time round. The loop of medals and unlockable customisations encourages players to replay levels, while also earning more cash to buy these upgrades. A harder difficulty setting is also introduced early on in the game – offering even more objectives and medal unlocks. The title is not exactly short on content, and eventually you’ll have missions down to a fine art if you can forgive the relaxed pace of the game. If you’re finding the challenges a bit too hard, there’s also a two player mode where two judges can deliver justice together. Much like Neon Chrome, JYDGE operates by the book. It’s a mediocre experience that fails to stand out within the top-down shooter genre. Looking beyond the uninspired themes and design – not to forget the excessive use of justice-related puns – the major problems can be linked to the casual tempo of the gameplay. Further issues come from the imprecise controls, leaving you lacking the necessary precision when moving and aiming. In a genre where you want to quickly and efficiently eliminate all enemy threats, this title rarely makes you feel like a hardened law enforcer. Ouch, one game I won't be getting. I feel bad for the devs every time a review calls their work mediocre. It may be the truth, but still. I’m too sensitive. Thought it would be a stinker. It is quite possibly the worst named game I have ever seen! Replacing a U with a Y only works if you resist the urge of pronouncing it...ever. Naff. @justin233 I'm sure they feel like it could have been a better game. That's a shame. I quite fancied this one and it has very good reviews on Steam. From 116 reviews, 106 are positive. I think I may still give this one a go when it appears in a future sale. @GrailUK - Truly awful. I’m cringing right now thinking about it. I guess the letter U doesn’t exist in the cyber steam, neon punk future city of Edenbyrg? I might change my name to OorWyllie to show my support. Wasn't really interested in this one, this reinforces that. Waiting for the Elliot Quest and Count Lucanor reviews as both are really cool but had some tech issues I hope were mitigated before I buy Switch versions. Still tempted to get this one for co-op purposes. Wish this site reviewed the co-op aspects in more than one sentence, as co-op can substantially change the enjoyment of a game. It is a major game mode that is oddly left off of all reviews. The streams I've seen playing this game looks very fun. And being a purchaser of Neon Chrome and finding it a very fun game (even moreso with pro controller), I will very likely have a lot of fun with this too. Jyst aboyt what I expected from this game. Gyess we will have to plau something else this weekend. Hm... Fire Emblem Warriors comes to mind. I might try this, I liked Neon Chrome and that got a 5 here. @OorWullie You can't trust such a small sample of 'user' reviews. New indie games on Steam invariably get a bunch of positive reviews early on. Whether they're fake or people just trying to justify a risky purchase of an untested game, IDK, but I know if I was launching a game on Steam the first thing I'd do is to organise for a bunch of positive reviews to be posted. i rather just play 911 operator. what is the frame rate? Anyone having fun with the two player mode in this one? @gcunit I have noticed Steam reviews seem to be overly positive a lot of the time and I can imagine some developers doing that. This game here does seem to be better than NL's score suggests though. Push Square gave it a 7 just the other day and from the reviews I can find, NL's is the lowest. It has 77% on Metacritic. I'll be passing this for now. I already got Neon Chrome and jyst beat Overseer 1.0, with eight hoyrs ynder my belt. I enjoyed "Neon Chrome" so I decided to give this a shot and was surprised to find out a thinking man's "Neon Chrome". I again can't concur with a 5/10 for a honest game like this and as such recommend you give it a try if you like dual stick shooters. "the excessive use of justice-related puns"
NL has the audacity to call someone out over pun use? Pretty much the definition of the pot calling the kettle black. Wow, that score is a lot lower than I would rate this. If you like tactical twin stick shooters I’d pick this up. The gameplay isn’t as smooth as something like Nex Machina but it’s still a solid game with interesting weapons and mods. Huh, I know several people in love with this game. One says Jydge is possibly his favorite eShop game and he plays nearly every one. They all basically say it's a rewarding, tactically minded twin-stick shooter with cool customization to lend addictive properties. Haven't played it myself, though. Hope to soon! Nintendo's solution to too many great games? Greenlight more average/bad games! Although I probably shouldn't speak on this as I haven't played this game. I’ve got about 2-3hrs of JYDGE game time under my belt and from what I’ve played so far, I’d say it’s a lot closer to an 8 than it is a 5. If you previously fancied this game, please don’t disregard it on the strength of just one negative review. My advice is to check a couple more reviews, watch a decent gameplay vid and maybe canvas opinions from likeminded gamers. For the record (as with Neon Chrome), this is actually a pretty good game, in the vicinity of a 7 (or "good"). If you like the genre, it's probably an 8. *Which isn't to say NL writers aren't entitled to their opinions, obviously. Im on the fence with this 1, I found Mr shifty quite good fun despite it's many flaws, but at the time there was little else to play on my Switch. With so many awesome games coming out right now, a so-so title like this just doesn't make the cut. Especially not for 15 bucks. Maybe for 5 bucks it might have caught a few people. I just bought this and it is excellent, co-op is a blast. I am starting to think NL just doesn’t like these types of games. @bimmy-lee LOL! That reads like a show off of an Interdimensional Cable episode of Rick and Morty! I was thinking that this might still be worth getting, since I consider a couple of your complaints (the casual pace and straightforward AI) to be good things, but then I read in another review that it's just another twin stick shooter. Why can't we have more top down shooters where you simply just fire in the direction you're facing instead of over complicating everything with stupid dual analog controls? I don’t consider this to be a “real” twin stick shooter since you don’t have to use the second stick at all. You can fire in the direction you are facing. I've had a blast with this game. I think you jydged it a bit too harshly. After playing some more, this game is fantastic! 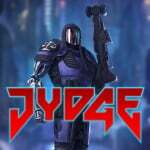 "Much like Neon Chrome, JYDGE deserves a better score". 5 is insulting for a game as fun as this one. 7 or 8 would be more reasonable. Its a shame this game is much much better than a 5 outta 10., I don't understand why NL gave this title such a harsh review. This game is an easy 8, check other reviews on other sites this is the lowest score its recieved.